Hello from Drupal Mountain Camp 2019! I’m just pasting in a tweet here. Click to read the thread. Mini-tutorial for #Drupal + #PhpStorm developers: How to Run PHP Code Beautifier on File Save. Long story short, turns out it was due to my locale settings not being configured properly. I applied the first suggestion of regenerating locales, and then the second one of setting default locales in /etc/default/locale, closing the SSH session, and opening it again. That fixed things. and wound up accidentally with stuff like site.site.nav.create because you double-replaced? [10/30/14, 10:13:52 PM] Kevin Kaland: it won’t match it if it already has the site. in front. it’s called a negative lookbehind. negative meaning “it is not there” and lookbehind meaning that it checks before a particular string. there’s also positive look(ahead|behind)s, which make sure things are there. Discovered today that Vagrant automatically rsyncs files to the Host VM when the Docker provider is used on a system that doesn’t natively support Docker. Sometimes, though, one wants to sync the files to a custom location, and might get errors when trying to sync them to two locations on the Host VM (as I was). It must have all started with a joke on iRC that my friend lefnire, creator of HabitRPG, might just be an advanced Node.js program. A few weeks later, a buddy and I took this to its logical conclusion. But even with novelty projects, there are things to be learned, and this project has exposed me to npm modules I probably otherwise never would have used. I’m going to go over a few of the architectural highlights (npm and not) in no particular order. After you npm install lefnire, typing lefnire runs him. 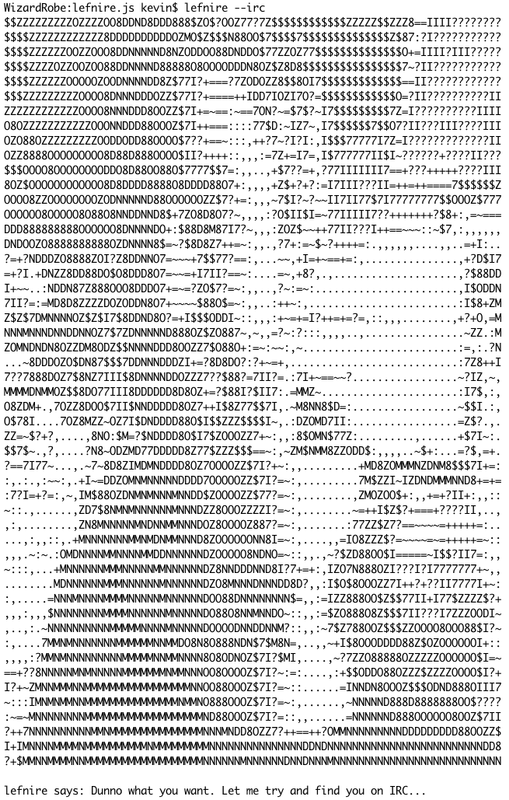 If you said, “ASCII art?” you would be correct. This was a friend’s idea, and it’s become a staple of the application. Currently, lefnire.js is lightly integrated with the HabitRPG and GitHub APIs. The HabitRPG API integration uses straight superagent requests. The GitHub API calls use github. When you say something containing “habit down,” he makes an API call to https://habitrpg.com/api/v1/status to check. When you ask him by his IRC name (I’ll be getting to IRC stuff in a second), he queries the GitHub API to find out the number of issues labeled “critical” for HabitRPG on GitHub. What would an automaton be without being able to log on to IRC and interact? lefnire.js uses node-irc to accomplish this. The library is pretty robust and follows Node.js patterns well. This is a fantastic example of an application that thrives on asynchronous execution. When you ask him if “habit is down,” and it is, that thread of execution will block. However, it won’t stop the bot from responding, thanks to the event listener model implemented by node-irc. Another interesting feature is a rudimentary implementation of mood, which is basically just a number between 0 and 30 (0’s the best). This doesn’t do too much yet. It affects his behavior a little bit. The number of GitHub criticals is the baseline metric. This is then adjusted up or down by how positive or negative Sentimental analyzes the up to the 30 most recent GitHub Events from lefnire to be. This is mostly issue comments, pull requests comments, and commit messages. When lefnire is in-channel, it also adjusts mood based on Sentimental text analysis of what he says. No database yet, so everything except what I can retrieve again through API calls is lost if I ctrl-C the bot and stop it. Those are the main highlights of the current implementation. A lot of things are planned. I doubt anyone would want to contribute to this, but I’d certainly be excited to receive some pull requests. If you follow me on Twitter, you probably already know all this. If not, however, allow me to explain. When I’m away from home, whether at a cafe or a Drupal event, there are a few things I take with me to ensure a pleasant working experience. You may have encountered me with them at a Drupal event. I’ve had the setup since SANDcamp 2012 and also had it with me at DrupalCamp NJ, DrupalCamp Twin Cities, and DrupalCamp Sacramento. These tools definitely increase my productivity (hint: one is a USB-powered monitor that you can carry around!). So, without further delay, check out my mobile office! Update: I’ve also sponsored DrupalCamp NJ (http://www.drupalcampnj.org/sponsors/fill-pdf-service) at the Silver level. Was an individual sponsor of DrupalCamp LA (http://2011.drupalcampla.com/sponsors/wizone-solutions) and attended. Presented on hooks with Oliver Seldman and subbed in for Christefano’s presentation (http://2011.drupalcampla.com/sessions/professional-staging-and-deployment-todays-best-and-worst-practices). Also scored a great new photo courtesy of Sawako Leslie (thanks!). Attended my first DrupalCon…in London (ahem, Croydon)! I also did an individual sponsorship for that (http://london2011.drupal.org/sponsor/wizone-solutions) and ran a couple informal discussion sessions (BOFs). Experienced Drutober with nearly back-to-back DrupalCamps.The first was the Pacific Northwest Drupal Summit. This was a pretty cool event (yeah, sponsored this also. See a trend? http://pnwdrupalsummit.org/sponsors/wizone-solutions). It was targeted more at developers, apparently, and it was really well organized. I mean really well. Everything just went so smoothly and was so professionally done. My paltry $50 (OK, $200 total) was worth every penny. The second camp was the Bay Area Drupal Camp, a.k.a. BADCamp. (Individual sponsorship in profile: http://2011.badcamp.net/attendees/wizonesolutions.) I had to work for this one (the Coder Lounge was around 15 minutes away from the sessions), but it was worth it, and I made some new acquaintances. My session on Fill PDF also made it in at the last second (http://2011.badcamp.net/program/sessions/fill-pdf-module-web-form-data-completed-pdf-form-out). That was surprising, but cool, and the presentation went pretty well. Drutober was interesting because it was the first time I went to DrupalCamps with concrete goals. I think that helped me get more out of it. SANDcamp 2012 (two sponsorships! https://www.sandcamp.org/sponsors#block-views-sponsors-block-11 and https://www.sandcamp.org/sponsors/fill-pdf-service) and DrupalCamp NJ (individual sponsor; see this page: http://www.drupalcampnj.org/event/attendees) are coming next. So it’s been an interesting year. In the coming year, I’m hoping to polish up Fill PDF Service and make it properly rock. That’s part of the reason for trying to ramp up the marketing a bit. We’ll see how it goes! I had a surreal experience yesterday. I was following online tutorials about setting up Apache + PHP-FPM (for example, this ServerFault question: http://serverfault.com/questions/326919/how-to-set-the-httpd-conf-when-using-php-fpm-with-php5-3-8-and-apache2). I’ll let you read that rather than re-hash it. My goal here is only to share quickly how I actually got this working. to my configuration. And, much to my shock, it actually worked! So, if you find yourself as frustrated with setting up Apache + PHP-FPM as I was, I hope this tip may ease your suffering. I adapted it to this for my task of replacing IP addresses. The first set of numbers is the old one (don’t delete the backslashes) and the second set is the new one. This command assumes all files in the directory are configuration files and do not start with a dot. Update: According to a commenter, sed -i 's/thisip/thatip/g' * should also work. I didn’t try that since I thought it wouldn’t work with multiple input files.